Soundown's TuffMass is a specially developed, mass-loaded vinyl (MLV) product offering superior acoustic transmission loss combined with good damping properties. Available in surface densities of 1/2, 1, 1.5, and 2lbs/ft2, TuffMass is suitable for use in all types of construction and offers STC ratings up to 32. Typical architectural applications include improving transmission loss of walls and floor/ceiling assemblies to reduce exterior noise or noise travelling between adjoining rooms or apartments. Adding 1lb/ft2 TuffMass behind the drywall will dramatically improve privacy between rooms, apartments, or condos. For marine applications, TuffMass is used as the acoustic septum in Soundown's assembled-in-place insulation programs. 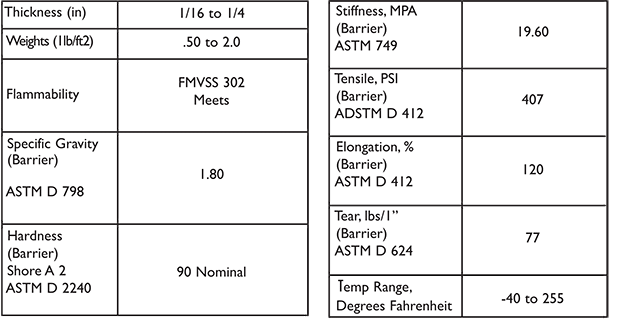 In the diagram below, TuffMass provides the acoustic barrier, which is sandwiched between a 4-inch fiberglass decoupler layer and 2 inches of acoustic absorption material. This highly effective treatment will block almost all airborne noise transmitted out of the engine room. TuffMass is also suitable for use in industrial equipment and enclosures where minimal space is allowed for insulation. When applied to sheet metal enclosures, TuffMass provides both sound blocking and vibration damping.